What a glorious day! So happy to have received my LG V40 ThinQ to test out. So far all I've done is open the box and compare the size of the body to LG G7 ThinQ and LG V30. I'm biased towards LG. While some people claim there's a ton of additional LG experience stuff packed into it's version of Android, I've never thought so. Compared to Samsung I've found the Android experience on the LG devices to be quite slim and closer to true Android than many others. While I do enjoy some of the cool additions in the Samsung and Moto devices, I still love my LG's. Especially the V30! The camera on the V30 in my opinion is superior to the quality of pictures I get on any other LG device! I love my LG G7, don't get me wrong. The camera and capabilities are killer... but I find for point and shoot, especially in low light scenarios, my V30 is honestly the best. So, it'll be interesting to see how we go with the new 5 camera LG V40 ThinQ. 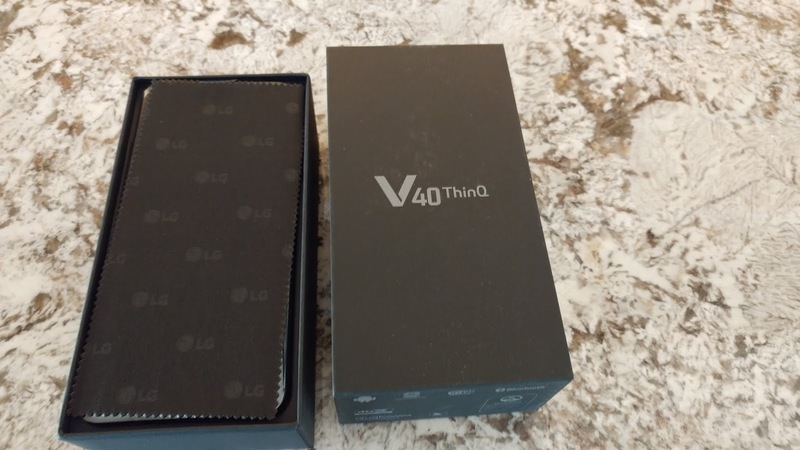 For now, here's all I've got when compared to the LGV30 and LG G7 ThinQ from initial unboxing. I have not activated the device yet - just to set expectations. 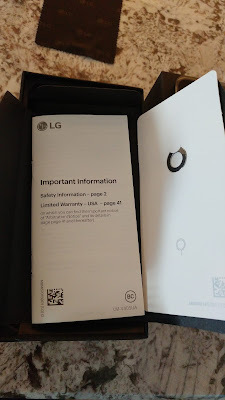 Open the box and what you see is an LG screen cleaning sham. LG staying with the 2 year commitment which extends the 1yr warranty to 2. 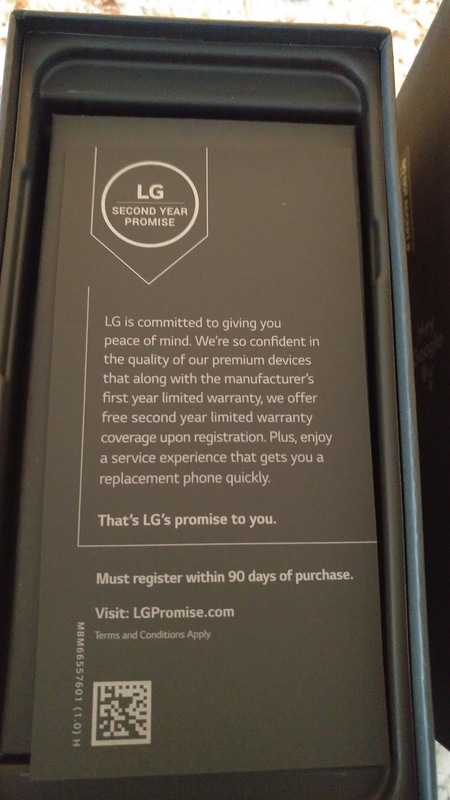 You have to register the device on LG within the first 90 days of purchase though - so don't wait! Fast Charger - looks like the prior charger to me. 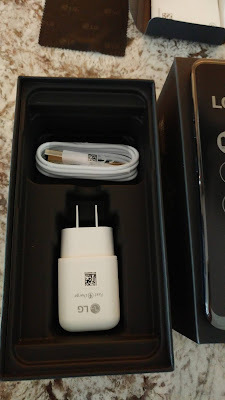 Will be interested in seeing how quickly the LG V40 ThinQ charges. My G7 is super fast! 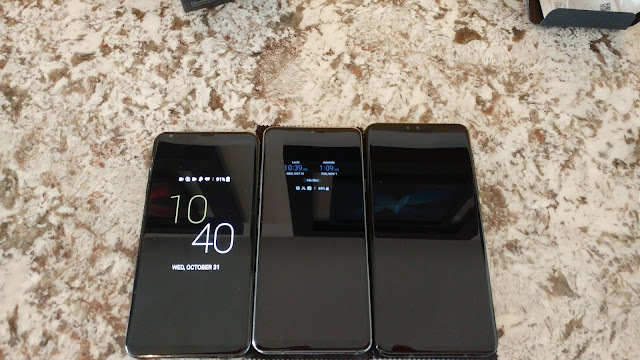 As you can see, the V30 is the shortest of the 3. In the middle the LG G7 is just a bit shorter than the V40 on the right. I still haven't figured out which is the go-forward iconic device model name for LG. All 3 are fantastic. 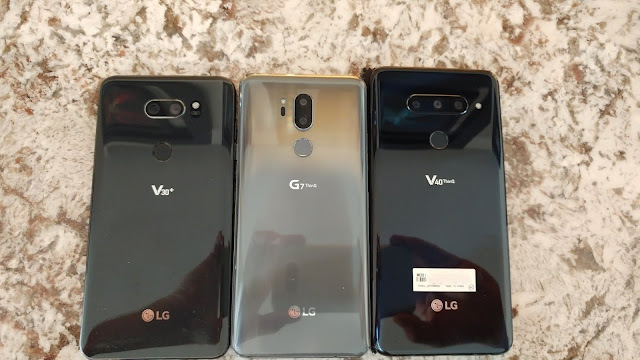 I assumed the V models would always be the 'larger' or 'plus' sized models, but as you can see here, the G7 and V40 are pretty close here and the G7 is taller than the V30. Same view from slightly higher up. I should mention all feel about the same weight in hand. Great solid quality devices all around. The V30 has been my daily driver, so please excuse any scratches/scuffs. 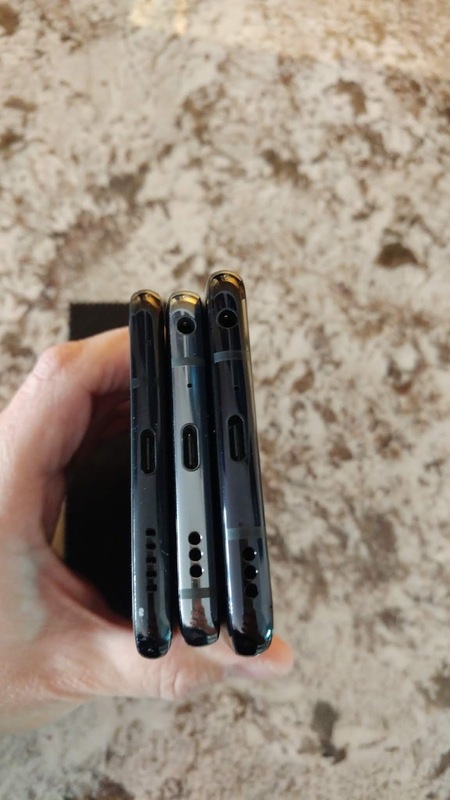 From the sides you can see the Headphone Jack has moved from the top of the device on the V30 to the Bottom on the LG G7 and LG V40 models. 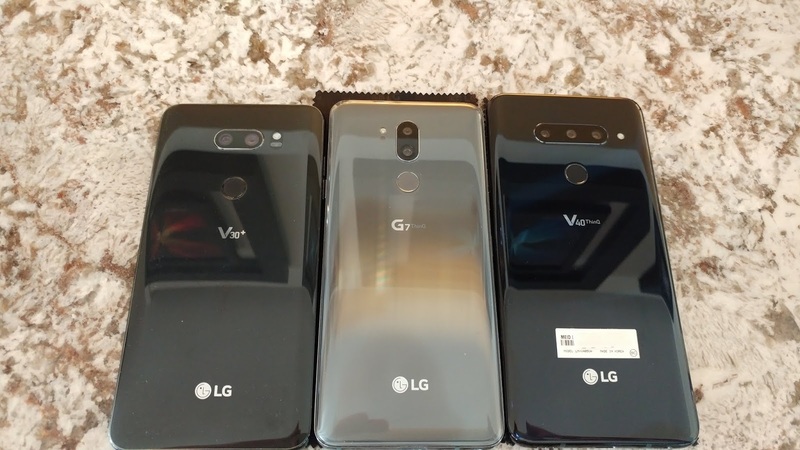 From a Width perspective the LG V30 and LG V40 are pretty much the same at 2.97 inches vs. 2.98 inches respectively. The V40 is much taller though. 5.97 inches vs. 6.25. The LG G7 is noticeably thinner in width than both V series models at 2.83 inches. 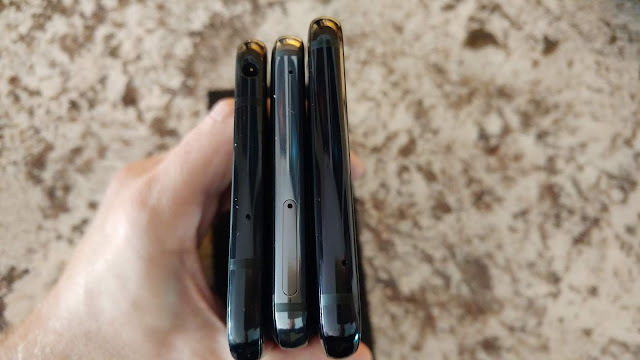 Volume Rockers on the left side of all 3 devices, though for the LG G7 and the V40 you'll also find the Google Assistant button. It's very convenient, especially when you're showing off your phone and don't want to say 'Hello Google' out loud. Just push the button and talk to the assistant. The drawer for the memory/sim card is on the right side of both V models, while it's on the top of the G7. 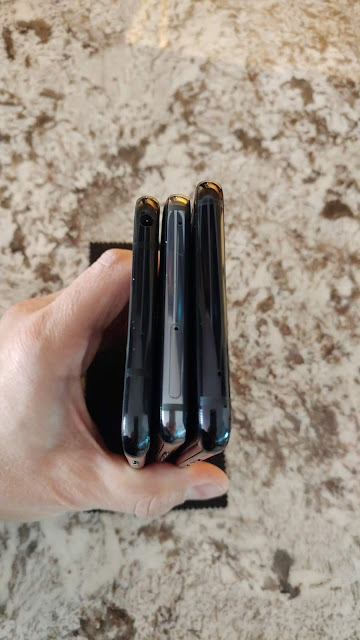 All 3 have mic holes on the top and bottom edge of the device. The power button on the V30 is integrated into the fingerprint scanner. 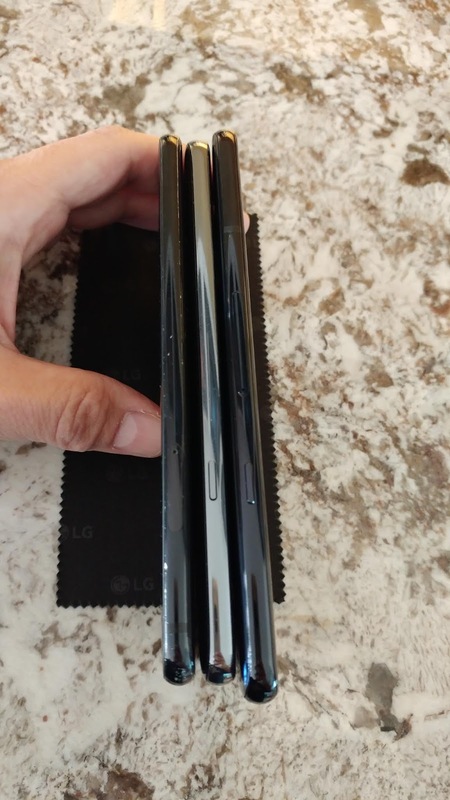 On the newer LG G7 and LG V40 the power button on the right side. The only thing I can say here is it's natural to find the power button there. I guess it's just habit from older handsets. The power button on the back of the V30 took a small bit of getting used to, but since that's where the finger goes for scanning it was a pretty good idea. I don't know if I have a preference. My suspicion is there's a certain amount of cost involved with a multi-purpose fingerprint scanner that is also used as a power button. Either way, works fine and I'm happy with both options. LG V30 has a top bezel, while V40 follows the G7 with the notch approach. I wasn't an advocate of it at first, but I've grown to like it and how it integrates with the G7 experience. I expect it'll be the same on the V40 too. Still, can't wait for the day when everything is hidden behind the screen. I use the V30 and G7 as my daily devices. One for work and the other for personal & band related activities. The hard part is deciding which one to shut off while I test out the LG V40 ThinQ! 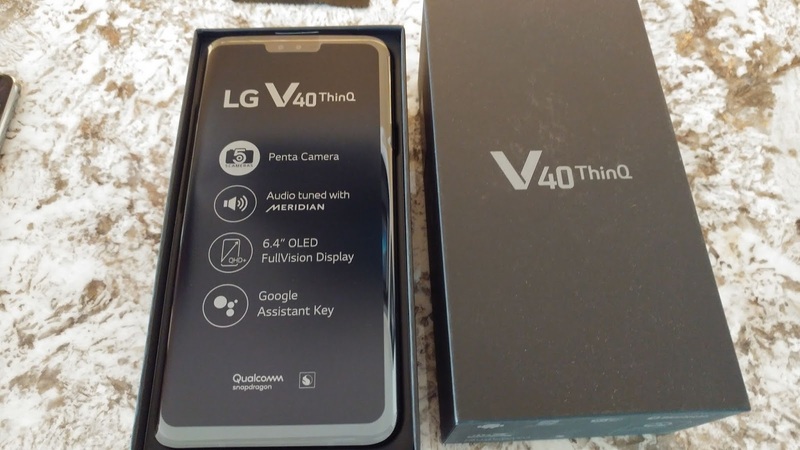 Have questions or thoughts to share about the LG V40 ThinQ? Tips/Tricks/Set up or whatever - drop me a line. I'd be happy to hear from you. Looking forward to using this device! More to come for sure. - edit - side note, images were taken with my LG G5. Still love that handset too!